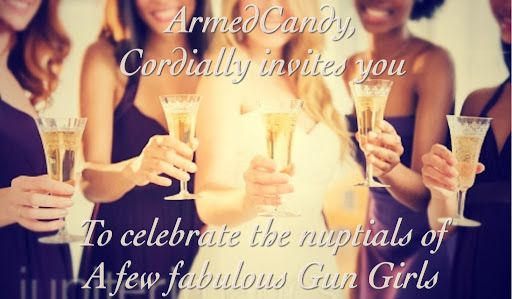 Maybe it's because I too have been bitten by the love bug this year, but I was just reflecting on what's happened since last SHOTShow and I've noticed that a LOT of Gun Girls got married. First, there was Natalie Foster of Girls Guide to Guns, who married her man Brandon in late August in an outdoor ceremony in Santa Margarita, CA. Right after Christmas, we were all shocked, including their guests, by a surprise wedding thrown by Shelley Rae, Managing Editor of GunUp the Magazine, and Caleb Giddings at the Wilde Rover Pub in Kirkland, WA. By uniting in holy matrimony, I'm convinced that these two will now form some sort of Brangelina of the gun writing world. To that end, they are asking that in lieu of gifts, donations can be made to NRA-ILA. Just under the wire (with SHOT only days away) my favorite Top Shot, Gabby Franco, married her hero-in-uniform and fellow crack shot, JD. Their romantic church ceremony occurred near the beach where they shared their first kiss.